Tonight Lisa made this labor-intensive lasagna based on a Cooking Light recipe, and added extra spices and mushrooms. 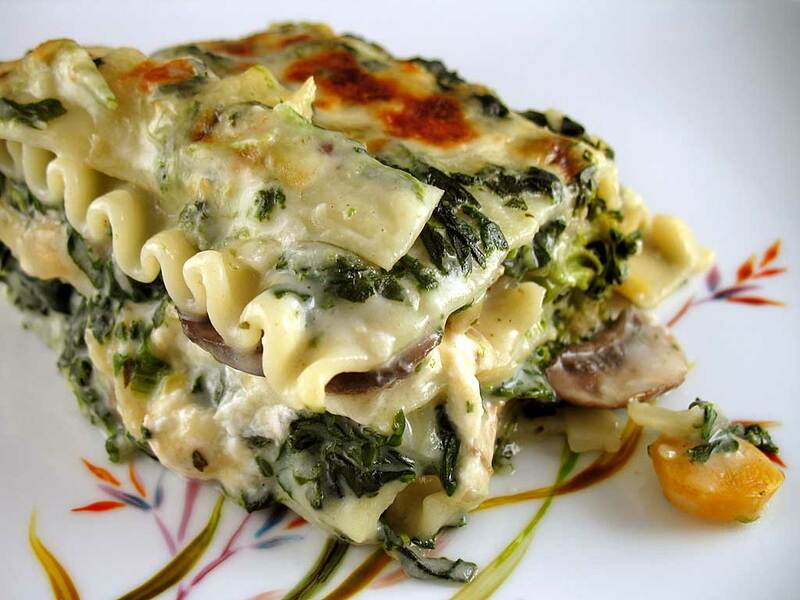 I’m usually a bigger fan of tomato-sauce based lasagna, but this one hit the spot with its variety in textures and sheer number of sauteed vegetables. Wow you’re on a roll with these Cooking Light recipes. Good picks. Me too! I still can’t believe it’s low fat. I love that we have enough leftovers for like three more meals. Good thing we liked it, then! Heat a large Dutch oven over medium-high heat. Coat pan with cooking spray. Add onion to pan; sauté 4 minutes or until lightly browned. Add garlic; sauté 1 minute. Spoon onion mixture into a large bowl. Heat 1 teaspoon oil in pan over medium-high heat. Add zucchini, mushrooms, and yellow squash; sauté 4 minutes or until tender and just beginning to brown. Add to onion mixture. Heat remaining 1 teaspoon oil in pan over medium-high heat. Add sliced carrot; sauté 4 minutes or until tender. Add chopped broccoli; sauté 4 minutes or until crisp-tender. Add to onion mixture. Sprinkle with 1/2 teaspoon salt and oregano; toss well to combine. Place flour in a medium saucepan. Gradually add milk, stirring with a whisk until blended. 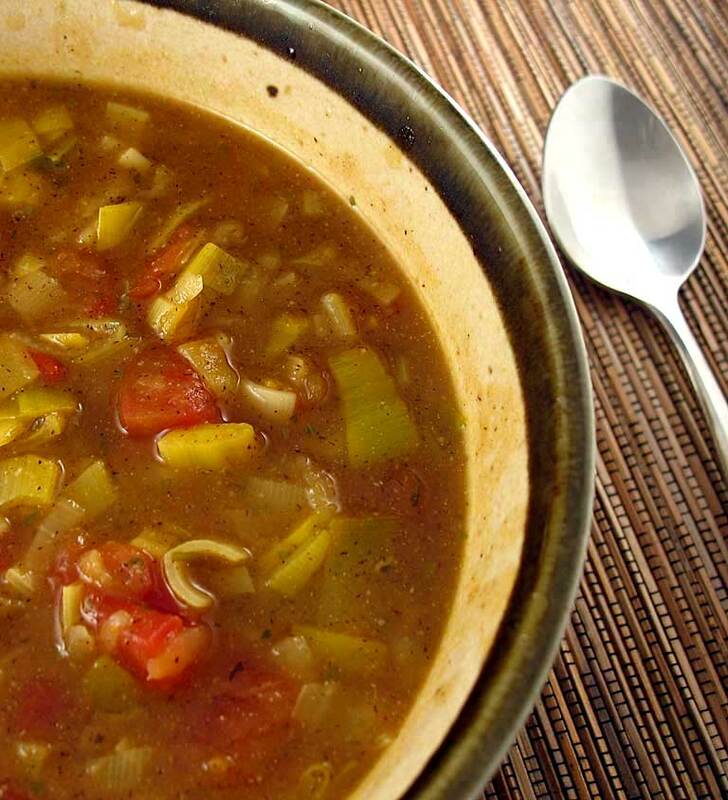 Bring to a boil over medium heat; cook 2 minutes or until thick, stirring constantly. Remove from heat. Add 1/2 cup Parmesan, remaining 1/2 teaspoon salt, pepper, and nutmeg; stir until smooth. Stir in spinach. Combine cottage cheese and 1 1/2 cups mozzarella; stir well. Spread 1/2 cup spinach mixture in bottom of a 13 x 9-inch baking dish coated with cooking spray. Arrange 4 noodles over spinach mixture in dish; top with half of cottage cheese mixture (about 1 1/2 cups), half of vegetable mixture (about 2 1/2 cups), and about 1 cup spinach mixture. Repeat layers, ending with noodles. Spread remaining spinach mixture over noodles; sprinkle with remaining 1/2 cup Parmesan and remaining 1/2 cup mozzarella. Cover and bake at 375° for 20 minutes. Uncover and bake an additional 20 minutes or until cheese is bubbly and beginning to brown. Let stand 10 minutes before serving. Lisa made this salad tonight as a starter for the lasagna. It’s modified from a Cooking Light recipe found online. Green beans are quickly cooked until crisp-tender and tossed with roasted red bell peppers and mushrooms in a red wine vinegar and cilantro dressing. I love salads like this. 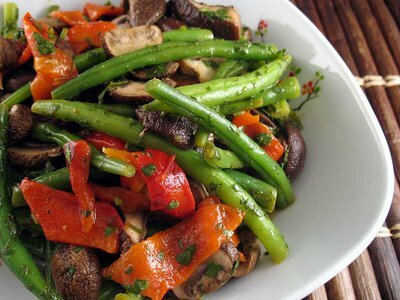 Yeah it reminds me of that other green bean and mushroom salad we did a while back. The green beans are so crisp! And I love, love, love roasted bells. The dressing is really vinegary, but delicious. It has half a cup of cilantro! Everything should have half a cup of cilantro in it. To roast red bell peppers, brush with a little oil and place under a broiler, rotating every few minutes, until blackened on all sides. Place in a paper bag and close; the steam coming off the peppers will make the skins easily removable. To roast the mushrooms, place in a shallow dish and cook in a 350 degree oven until they give up their juices. Combine first 6 ingredients in a large bowl. Stir well; set aside. Steam beans, covered, 3 minutes or until tender. Drain and rinse under cold water; drain well. Add beans and remaining ingredients to bowl; toss gently to coat. Cover and marinate in refrigerator up to 24 hours. Serve with a slotted spoon. This week’s CSA box included plenty of potatoes and spinach, so this dish was an obvious choice. The recipe below is modified from a few different sources online. 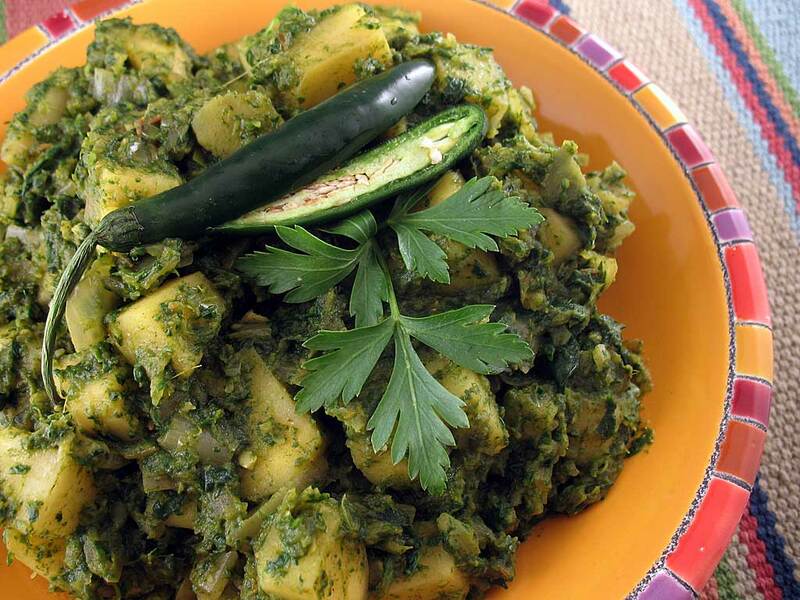 It really is — I love that combo of spinach and potatoes. Did you mention that we’re currently eating this with delicious garlic naan and some saffron rice? No, I didn’t… but I guess you just did. Can we have this every week? Saute the garlic, ginger, onions and green chili together until the onion starts to brown. Then add the cilantro and spinach and cook until the spinach wilts. Place in a blender and puree to desired consistency. Cook the potatoes (boil, or microwave) until almost done. In a deep pan heat the butter and fry the cumin seeds for about 20 seconds till they start to lightly brown. Add the turmeric and other spices and fry for about 30 seconds. Add the spinach-onion mixture, salt, and potatoes and cook for a few minutes for the flavors to meld and the potatoes to fully cook. We made this leek soup as a starter dish this week. It was a good way to use up some leftover produce, and we had the rest of the ingredients on hand. I’d recommend adjusting the spices according to your own preferences, the recipe as listed was just a little bland. Anything to say about this one? You mentioned that it was kinda bland, right? It was much better after you added those extra spices at the end! In a medium pot, saute leeks and carrots in olive oil until tender, about 5 minutes. Add garlic and cook briefly, about 30 seconds, stirring. Add flour and cook about 30 seconds, stirring constantly. Add stock and bring to a boil. Reduce heat and add remaining ingredients. Simmer for about 5 minutes. Adjust seasonings to taste. Jeremy and Autumn came over for dinner one night this week — Lisa made these fresh rolls, which filled us up much more than the tiny seafood salad I made. The peanut sauce was also really, really good. I’m glad I made as many as I did. That dinner you made was barely enough for one, let alone four! How’d you get the tofu to not get all mushy? Apparently the trick is to roll it in a bit of flour first. It works really well! Um, did the four of us just eat 17 of these things? Bring a large pot of water to a boil. Reduce to a simmer. Add shrimp; cook until pink and cooked through, about 2 minutes. Slice cooked shrimp in half lengthwise. Set aside. In a medium bowl, cover rice noodles with hot water by 2 inches; let soak for 15 minutes. Drain, and rinse under cold water. Set aside. Cut tofu into sticks, roll in flour and lightly fry in oil. Place on paper towel to drain. Fill a shallow dish with warm water. 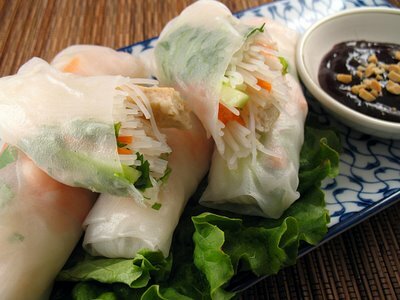 Working with 1 rice-paper wrapper at a time, soak in water for 30 seconds; immediately lay flat on a work surface. Place 3 reserved shrimp halves, cut sides up, on bottom third, leaving a 1/2-inch border. Place 1 piece of tofu over shrimp. Top with 1/4 cup assortment of rice noodles, carrots, cucumbers, mint, basil, and cilantro. Fold bottom of wrapper over fillings; roll over once, tuck in sides, and finish rolling. Place finished roll on a plate; cover with a damp paper towel. Repeat process with remaining ingredients. Serve with peanut dipping sauce.